Durga Puja is a Hindu celebration of the Mother Goddess and the victory of the revered warrior Goddess Durga over the evil buffalo demon Mahishasura. The festival honors the powerful female force (shakti) in the Universe. The dates of the festival are determined according to the lunar calendar. Durga Puja is celebrated during the last five days of Navaratri and Dussehra. In 2018, Durga Puja takes place from October 15 to October 18, followed by the grand immersion of Durga idols on October 19. Bengali communities in other locations across India celebrate Durga Puja as well. 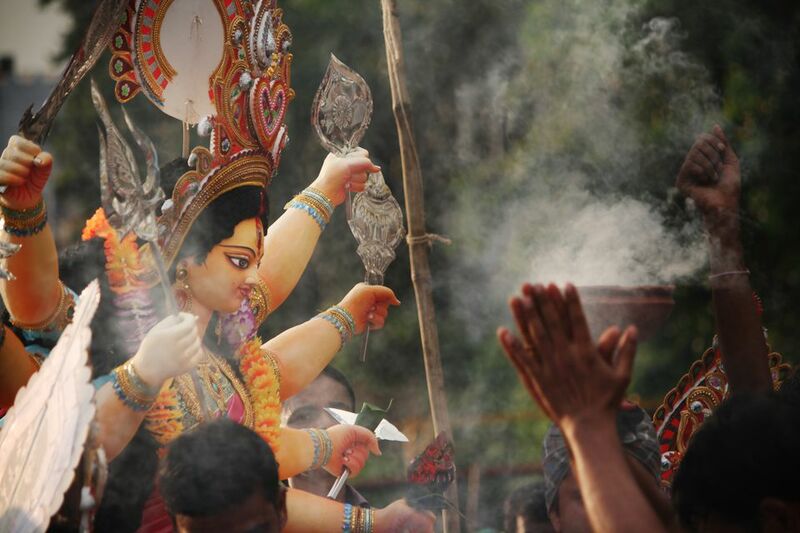 Substantial Durga Puja festivities take place in both Mumbai and Delhi. In Delhi, head to Chittaranjan Park (Delhi's mini Kolkata), Minto Road, and also the city's oldest traditional Durga Puja on Alipur Road at Kashmere Gate. At Chittaranjan Park, the must-see pandals are Kali Bari (Kali Mandir), B Block, and the one near Market 2. In Mumbai, the Bengal Club holds a grand traditional Durga Puja at Shivaji Park in Dadar, which has been taking place there since the mid-1950s. A glamorous and hip Durga Puja happens at Lokhandwala Garden in Andheri West. Many celebrity guests attend. For an all-out Bollywood extravaganza, don't miss the North Bombay Durga Puja. In addition, there are two Durga Pujas in Powai. The Bengal Welfare Association holds a traditional one, while the Spandan Foundation highlights social issues. The Ramakrishna Mission in Khar conducts an interesting Kumari Puja, where a young girl is dressed up and worshiped as Goddess Durga, on Asthami. Durga Puja is popular in Assam and Tripura (in North East India), and Odisha as well. Head to Bhubaneshwar and Cuttack in Odisha to see Durga idols decorated with intricate silver and gold filigree work, which is a local specialty. It's absolutely spectacular and totally worth getting off the beaten track to see! Durga Puja is celebrated in a similar manner to the Ganesh Chaturthi festival. The start of the festival sees huge, elaborately crafted statues of Goddess Durga installed in homes and beautifully decorated podiums all over the city. At the end of the festival, the statues are paraded through the streets, accompanied by music and dancing, and then immersed in the water. What Rituals Are Performed During Durga Puja? Around one week before the festival starts, on the occasion of Mahalaya, the Goddess is invited to come to the earth. The eyes are drawn on the idols of the Goddess on this day, in an auspicious ritual called Chokkhu Daan. In 2018, this will take place on October 8. After the idols of Goddess Durga have been installed, a ritual is performed to invoke her holy presence into them on Saptami. This ritual is called Pran Pratisthan. It involves a small banana plant called a Kola Bou (banana bride), which is bathed in a nearby river, dressed in a sari, and used to transport the Goddess's energy. In 2018, this will take place on October 16. Prayers are offered to the Goddess every day during the festival, and she is worshiped in her various forms. On Ashtami, Goddess Durga is worshiped in the form of a virgin girl in a ritual called the Kumari Puja. The word Kumari is derived from Sanskrit Kaumarya, meaning "virgin." The girls are worshiped as manifestations of the divine female energy, with the aim of evolving the purity and divinity of women in society. The divinity of Goddess Durga is believed to descend into the girl after the puja. In 2018, the Kumari Puja will take place on October 17. After the evening aarti ritual on Ashami, it's custom for the devotional Dhunuchi folk dance to be performed in front of the Goddess to please her. This is done, to the rhythmic beating of drums, holding an earthen pot filled with burning coconut husk and camphor. Worship is concluded on Navami with a maha aarti (great fire ritual), which marks the end of the important rituals and prayers. In 2018, this will take place on October 18. On the last day, Durga returns to her husband's abode and the statutes are taken for immersion. Married women offer red vermillion powder to the Goddess and smear themselves with it (this powder denotes the status of marriage, and hence fertility and bearing of children). Belur Math in Kolkata holds an extensive program of rituals for Durga Puja, including a Kumari Puja. The ritual of Kumari Puja was started by Swami Vivekananda at Belur Math in 1901 to ensure that women were respected. The Durga Puja festival is an extremely social and theatrical event. Drama, dance, and cultural performances are widely held. Food is a huge part of the festival, and street stalls blossom all over Kolkata. In the evenings, the streets of Kolkata fill with people, who come to admire the statues of Goddess Durga, eat, and celebrate.